If you scan online headlines, you might think taking ibuprofen every day can help you live a longer and healthier life. Not long ago these headlines were running rampant across the web. But they’re very misleading. Well, once the media got ahold of the concept, they took off with it. “Taking ibuprofen every day could extend your life by up to 12 YEARS,” shouts one headline. Others are similar. If you don’t dig deeper into the articles, it might sound like a good idea to start taking ibuprofen each day. I personally don’t recommend using any type of nonsteroidal anti-inflammatory medication (NSAID). And that includes ibuprofen. Let alone taking it every single day in the hopes of extending your life. That’s because there are a lot of health problems associated with these drugs. In fact, it’s a pretty sure bet they’ll shorten your lifespan. Double your risk of heart failure, even if you don’t have heart disease. It increases the odds by more than 10 times if you do have a history of heart problems. Damage your kidneys, cause liver failure and – even worse – boost your chance of developing kidney cancer by about 50%. Lead to life-threatening gastrointestinal orders, leaky gut syndrome and ulcers. Accelerate the breakdown of joint cartilage and prevent the formation of new cartilage. This hastens deterioration of your joints and accelerates arthritic damage. While NSAIDS are supposed to be anti-inflammatory, they don’t really work naturally with your body. They work by blocking the action of special enzymes called Cox-1 and Cox-2. These enzymes are the major source of prostaglandins – hormone-like substances that are tied to inflammation. However, these pills don’t do anything at all to address your underlying problem. And it’s pretty clear none of them, including ibuprofen, is going to do anything to make your life longer or healthier. The real cause of inflammation, chronic pain, and a shorter lifespan is premature cellular aging. Or, more specifically, shortened telomeres. The more quickly your telomeres shorten, the faster you age. Longer telomeres, on the other hand, are associated with robust health and a longer lifetime. The absolute best way to extend your life and defeat pain- and disease-causing inflammation is to protect your telomeres. NSAIDs won’t do that. But there are a number of natural alternatives that will. Omega-3 fatty acids have an incredible ability to fight off inflammation. They can even improve joint pain just as well as NSAIDS. Better yet, Omega-3s can slow down the progression of osteoarthritis – and cut your risk of developing it by half. More importantly, omega-3 fish oil may be one of the most essential nutrients for telomere support. Omega-3s not only slow down telomere shortening, but can also help lengthen them. And, it can happen in as little as four months. I suggest investing in a high-quality fish oil supplement. Look for one that contains oil from fresh, wild-caught, deep-sea fish. And make sure it’s been molecularly distilled and tested for purity (i.e., no mercury). Aim for 1,200 mg. of EPA and 800 mg. of DHA daily for telomere lengthening. Low levels of vitamin D are associated with shorter telomeres… and high levels of C-reactive protein, or CRP. Now, you may have heard about this protein and its relationship to heart disease and stroke. But you probably haven’t heard that it’s also linked with pain threshold levels. The higher your CRP, the more sensitive you are to pain. During warm weather, boosting your levels of this nutrient is as easy as spending 15 or more minutes outdoors each day without sunscreen. If cold or inclement weather has you stuck inside, it’s easy enough to supplement. Look for vitamin D3 in the cholecalciferol form for the most benefit. I suggest 2,000 IU daily, or up to 5,000 IU if you’ve been tested as deficient. Reduced levels of folic acid and Vitamin B12 can lead to telomere shortening and dysfunction. These two vitamins are also related to high levels of an inflammatory marker called homocysteine. Homocysteine, in itself, shortens telomeres. Now, get this. Migraine sufferers tend to have shorter telomeres. And many of them also have high homocysteine levels. I suggest 800 mcg. of activated folic acid and 1,000 mcg. of B12 daily. Add 20 mg. of B6 for added homocysteine support. Look for a form of folic acid that contains folate from organic, dark-green, leafy veggies or 5-methyltetrahydrofolate (5-MTHF). I also recommend sticking with a Mediterranean-style diet. This way of eating protects your telomeres and eliminates many inflammatory foods from your diet. Load your plate with antioxidant-rich veggies and fruits. Choose wild-caught fish as your top protein. Eat plenty of nuts and seeds. Enjoy a small glass of red wine with dinner. These foods will help keep your telomeres longer and lower inflammation levels throughout your body. 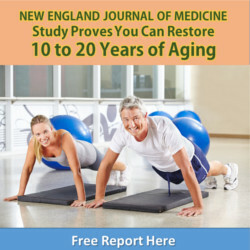 This way you can grow old without those dreaded aches and pains associated with aging. Bhala N, et al. “Vascular and upper gastrointestinal effects of non-steroidal anti-inflammatory drugs: meta-analyses of individual participant data from randomised trials.” Lancet. 2013 Aug 31;382(9894):769-79. Page J, et al. “Consumption of NSAIDs and the development of congestive heart failure in elderly patients: an underrecognized public health problem.” Arch Intern Med. 2000 Mar 27;160(6):777-84. Cho E, et al. “Prospective Evaluation of Analgesic Use and Risk of Renal Cell Cancer.” Archives of Internal Medicine, 2011; 171 (16): 1487. Hauser, RA. “The Acceleration of Articular Cartilage Degeneration in Osteoarthritis by Nonsteroidal Anti-inflammatory Drugs.” Journal of Prolotherapy. 2010;(2)1:305-322. Maroon JC, et al. “Omega-3 fatty acids (fish oil) as an anti-inflammatory: an alternative to nonsteroidal anti-inflammatory drugs for discogenic pain.” Surg Neurol. 2006 Apr;65(4):326-31. This entry was posted in Pain Relief and tagged NSAIDs, pain, pain relief on January 30, 2015 by Advanced Natural Wellness.